The Empire Strikes Back is how you do a sequel. The best way of building onto a movie that already has great characters, a solid fan base and a world full of mythology and history is to expand and develop. Don’t repeat what you’ve done before, don’t waste time trying to introduce what people already know and most important of all, go bigger, bolder and in the case of the first Star Wars sequel, darker. It doesn’t start that way. The beginning of The Empire Strikes Back is a bold battle on a snow planet and it looks like nothing we had seen in the first instalment. It is literally like director Irvin Kershner and George Lucas decided to get as far away from the desert planet of Tatooine as possible. It isn’t just the unique landscape. The actual battle on Hoth is bigger than most of what is in the first Star Wars and sets the scale for the rest of the movie. The ambitious ways in which the Rebellion pilots bring down the huge AT-AT Walkers still brings a smile and looks impressive, even with 1980’s effects. 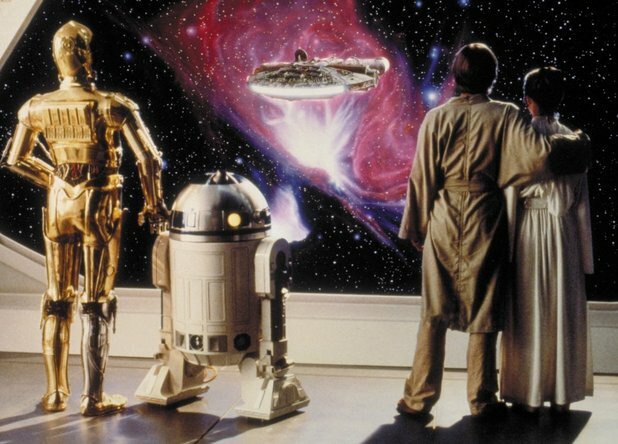 In fact, most of what is iconic about Star Wars is found in The Empire Strikes Back. Luke meeting Yoda is key to the whole series and although the pint-size Jedi is clearly from Jim Henson’s workshop, he is still as convincing and impressive as ever, especially when he transforms from silly little creature to wise, old Jedi Master. The fact that you forget he is puppet is testament to how well the character is created. It is also a key part of Luke Skywalker’s character development too. The biggest issue with Luke in the first Star Wars is that he is a whiny brat for a long stretch of the film. As heroic as he seems, there is still that brat in there, until he meets Yoda and we start to get the character that becomes so legendary and iconic by the end of the series. This film doesn’t really belong to Luke Skywalker, even if he does get the big set-piece at the movie’s finale. This film is really the development of Leia and Han Solo’s story. The chemistry between the two was hinted at in the first movie and it is turned up to 11 in the sequel. Han Solo couldn’t be cooler in this movie, from his cocky, confident and arrogant way he evades the Empire for most of the movie to his more humble fate at the end of the film. Harrison Ford seems to relish the role and is clearly the reason it has become a staunch favourite for most fans of the series. Han Solo offers some much-needed levity when the final act begins though as The Empire Strikes Back gets noticeably dark. From scenes of (implied) torture, the helpless fate of Han Solo himself and the very dark turn the final lightsaber battle takes too. It is a much improved battle on the first movie and effectively demonstrates the power of Darth Vadar compared to Luke Skywalker. That he starts the battle just using one hand and ultimately beats the Jedi trainee with little effort summarises the differences between the two. There are some of the coolest, most famous shots of the whole trilogy in this sequence and it is staged brilliantly, right down to the final tumble by Skywalker. I’m not a huge fan of cliffhanger sequels. It has been done so poorly recently that it has become a tired franchise cliché but Star Wars demonstrates how to do it effectively, completely shifting the dynamic of the movie but leaving that tantalising piece of hope for the third part of the franchise. All the positives doesn’t make it a perfect movie though. There are some strange, ill-conceived moments, like Luke battling “himself” in the strange cave and the moments where the Millennium Falcon is in it’s own cave seems to slow the movie’s pace. The least said about C3PO, who becomes strangely annoying compared to the last movie, the better too. These don’t ruin what is a great movie though and a perfect way to do a sequel. Overall, The Empire Strikes Back is a great example of how to develop a franchise. Star Wars was a good stand-alone movie but now it is a huge, epic story with great, well-developed characters, a sinister villain, the best character in peril and a very dark situation for the heroes. The perfect way to enter part 3. RANDY: Not a sequel, part of a original planned trilogy. Haven’t resolved this one yet as Star Wars was never intended to be a first part of a trilogy. Only after its wild success did they add the Episode IV to the opening scrolling text. It was always a trilogy. Lucas didn’t add “Episode IV” to the crawl until Empire because he didn’t want to confuse the audience. As far as I know, he had nine episodes planned from the beginning, or at least the general story for them. Yeah, I first heard 9, then 12, then in an interview with Maltin on the Empire DVD he hinted it was only 6. “Planned” is the key word as he wasn’t green-lit for a trilogy until IV’s success was clear. “Episode IV” though was added in ’77 within a few months of its release. Watching the first Star Wars you never feel like it is part of a bigger story. That’s either because Lucas is “lying” and decided, as it looked to be a success, that he would make it a series or maybe it is because today, movies hint towards bigger stories so much that it feels strange to have a movie as part of a bigger story which is also self-contained. I’m fairly sceptical so I’m not hugely convinced it was “always” supposed to be a series.